It’s the first time I realised that I was aware of Scorsese as a director. I saw it on VHS when I was probably about 15 or something like that. I felt like there was a line in the sand of ‘before Taxi Driver’ and ‘after Taxi Driver.’ That you could make something that was incredibly emotional and felt really authentic and realistic, but at the same time being impressionistic. And I’d never seen anything like that before. The stuff I’d liked before that had been more like Alan Clarke. Alan Clarke has his own style of being impressionistic with the more sociorealist stuff I guess. 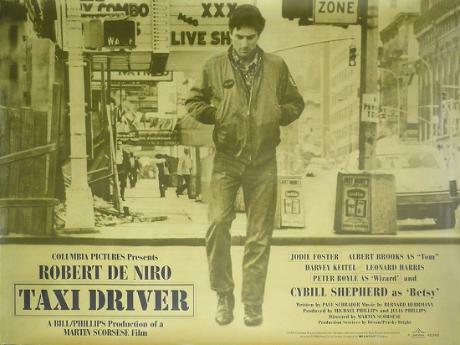 So, yeah, Taxi Driver - I remember watching it and feeling really unnerved and confused. But this is also a time before knowledge, there was no internet, there were no books about films that I would have known about at that time. So everything that I saw from when I was like 9 till I was probably about 23, I saw completely blind. So that movie as far as I was concerned was like Taxi with Danny DeVito, you know? Why would you watch a film about a taxi driver, It sounds really boring! But I lived in Camden at the time, and in Camden Market there were always these pictures of De Niro, photographs of him with the model and holding the guns and stuff, and that and A Clockwork Orange seemed to be the big things. Culturally you knew about them before you saw the films, especially Clockwork Orange. I didn't get to see it until I went to university. I had to go to Paris to see it because you just couldn’t see it in the UK. I went to a cinema that used to play Clockwork Orange every day. You know, for Brits who wanted to see it! So yeah, Taxi Driver. And when I say Taxi Driver, I really mean all of Scorsese’s films. Because after that I would have sought out everything that he’d done. So there probably wasn’t a hell of a lot of stuff, maybe Raging Bull was out at the time. And then I saw Goodfellas and Casino, and to this day he’s a favourite.